ArcSoft MediaConverter 4 ($50) is an easy-to-use video transcoder that's tailored for output to handheld devices. Alas, we're talking close but no cigar. The interface is a tad odd, it lags behind competitors such as Xilisoft in codec support, and it's rather pricey. MediaConverter 4's interface is for the most part handsome, but the large ATI Stream, nVidia Cuda, SimHD, and YouTube logos are like bad product placement in a movie--distracting. The super-large icons that ArcSoft adds to the Windows right-click context for files it supports menu also look out of place with any version of Windows. Microsoft standardized the placement of menus and the like precisely so that users didn't have to relearn basic navigation for every single program. This was considered a huge leap forward in user interface design, and most users quietly appreciate it or even take it for granted. ArcSoft's decision to place the main menu under a wrench icon on the right side of the main window might seem logical to the designers--but no one else. There are other placement foibles, but once you've put in the time learning it, ArcSoft MediaConverter 4 is a breeze to use. In most cases all that's required is to click on one of the large icons on the left that specify a destination (iPhone, PSP, Treo, Creative Zen), add files, then click start. MediaConverter 4 supports a large, albeit not comprehensive, array of file types. These include MPEG, AVCHD and DVD (non-copy-protected) .VOB files, but you'll need Windows Media Player 10 or later installed to handle or output the latest WMV files. The vendor's Web site mentions support for Real Media; however, I had to install Real Alternative before MediaConverter would recognize .rm and .rmvb files. This instilled hope that the program was DirectShow-aware, however, it didn't recognize Xiph's OGG Theora codec, so its DirectShow awareness is limited. 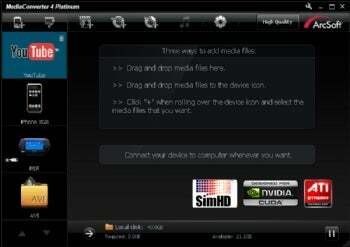 It also complained that it could not find an MP3 audio decoder for a DivX/MP3 Kingdom of Heaven trailer. Add all that up, and I was less than impressed. When it does work correctly, which is the majority of the time, ArcSoft MediaConverter 4 is fast and produces nice output. However, with free alternatives such as Windows Media Player and iTunes available--as well as the only slightly more expensive Xilisoft Video Converter Ultimate ($56)--with far more comprehensive codec support, there don't appear to be any cigars in sight.